When we design a complex system, we often start with a rough outline and fill in details later, one piece at a time. And if the system is supposed to be adaptive, these details may need to changed as the system is actually being used! The use of operads should make this easier. One reason is that an operad typically has more than one algebra. Remember from Part 3: an operad has operations, which are abstract ways of sticking things together. An algebra makes these operations concrete: it specifies some sets of actual things, and how the operations in the operad get implemented as actual ways to stick these things together. So, an operad can have one algebra in which things are described in a bare-bones, simplified way, and another algebra in which things are described in more detail. Indeed it will typically have many algebras, corresponding to many levels of detail, but let’s just think about two for a minute. which ‘forgets the extra details’. This map should be a ‘homomorphism’ of algebras, but I’ll postpone the definition of that concept. Let me give some examples. I’ll take the operad that I described last time, and describe some of its algebras, and homomorphisms between these. That’s what we might use in a search and rescue operation. The points could represent boats, and the edges could represent communication channels. Then I’ll give an algebra with even more detail, where two points connected by an edge can’t be too far apart. This would be good for range-limited communication channels. Then I’ll give an algebra with still more detail, where the locations of the points are functions of time. Now our boats are moving around! The operad from last time was called Here is the network model of simple graphs. 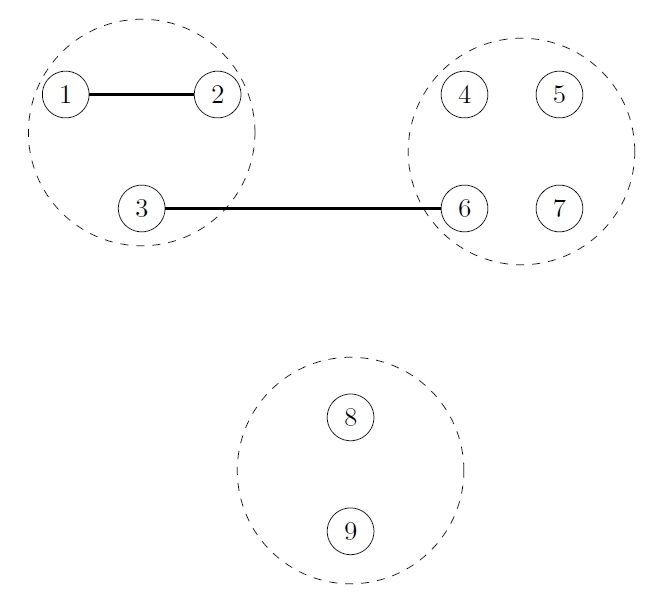 The best way to picture an operation of is as a way of sticking together a list of simple graphs to get a new simple graph. Note that this operation is itself a simple graph. 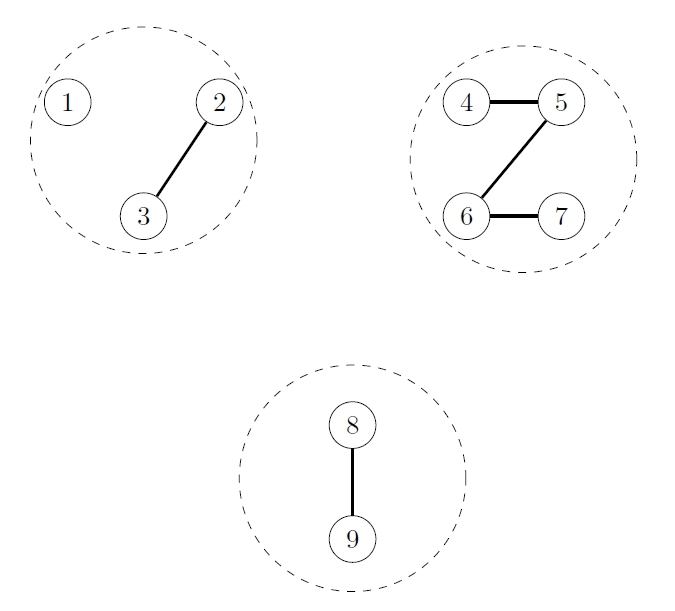 An operation in is just a simple graph with 9 vertices, where we have labelled the vertices from 1 to 9. This operad comes with a very obvious algebra where the operations do just what I suggested. In this algebra, an element of is a simple graph with vertices, listed in order. Here is any natural number, which I’m calling ‘t’ for ‘type’. But we can also make up a more interesting algebra of Let’s call this algebra We’ll let an element of be a simple graph with vertices, listed in order, which are points in the plane. My previous pictures can be reused to show how operations in act on this new algebra The only difference is that now we tread the vertices literally as points in the plane! Before you should have been imagining them as abstract points not living anywhere; now they have locations. What if our communication channels are ‘range-limited’? For example, what if two boats can’t communicate if they are more than 100 kilometers apart? Then we can let an element of be a simple graph with vertices in the plane such that no two vertices connected by an edge have distance > 100. Now the operations of our operad act in a more interesting way. If we have an operation, and we apply it to elements of our algebra, it ‘tries’ to put in new edges as it did before, but it ‘fails’ for any edge that would have length > 100. In other words, we just leave out any edges that would be too long. It took me a while to figure this out. At first I thought the result of the operation would need to be undefined whenever we tried to create an edge that violated the length constraint. But in fact it acts in a perfectly well-defined way: we just don’t put in edges that would be too long! This is good. This means that if you tell two boats to set up a communication channel, and they’re too far apart, you don’t get the ‘blue screen of death’: your setup doesn’t crash and burn. Instead, you just get a polite warning—‘communication channel not established’—and you can proceed. The nontrivial part is to check that if we do this, we really get an algebra of our operad! There are some laws that must hold in any algebra. But since I haven’t yet described those laws, I won’t check them here. You’ll have to wait for our paper to come out. Let’s do one more algebra today. For lack of creativity I’ll call it Now an element of is a time-dependent graph in the plane with vertices, listed in order. Namely, the positions of the vertices depend on time, and the presence or absence of an edge between two vertices can also depend on time. Furthermore, let’s impose the requirement that any two vertices can only connected by an edge at times when their distance is ≤ 100. When I say ‘functions of time’ here, what ‘time’? We can model time by some interval But if you don’t like that, you can change it. This algebra works more or less like The operations of try to create edges, but these edges only ‘take’ at times when the vertices they connect have distance ≤ 100. There’s something here you might not like. Our operations can only try to create edges ‘for all times’… and succeed at times when the vertices are close enough. We can’t try to set up a communication channel for a limited amount of time. But fear not: this is just a limitation in our chosen network model, ‘simple graphs’. With a fancier network model, we’d get a fancier operad, with fancier operations. Right now I’m trying to keep the operad simple (pun not intended), and show you a variety of different algebras. 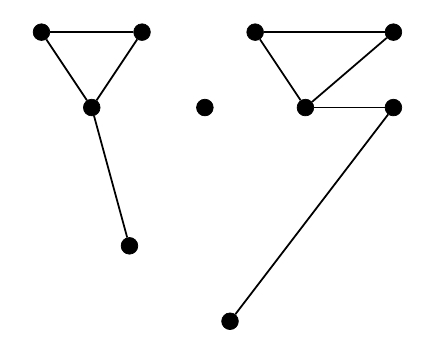 The homomorphism takes a simple graph in the plane and forgets the location of its vertices. The homomorphism depends on a choice of time For any time it takes a time-dependent graph in the plane and evaluates it at that time, getting a graph in the plane (which obeys the distance constraints, since the time-dependent graph obeyed those constraints at any time). We do not have a homomorphism that takes a simple graph in the plane obeying our distance constraints and forgets about those constraints. There’s a map sending elements of to elements of in this way. But it’s not an algebra homomorphism! 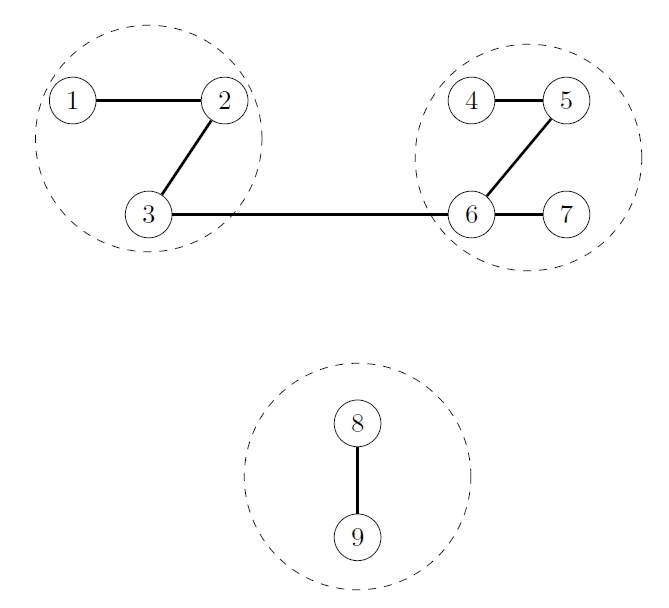 The problem is that first trying to connect two graphs with an edge and then applying may give a different result than first applying and then connecting two graphs with an edge. In short: a single operad has many algebras, which we can use to describe our desired system at different levels of detail. Algebra homomorphisms relate these different levels of detail. Next time I’ll look at some more interesting algebras of the same operad. For example, there’s one that describes a system of interacting mobile agents, which move around in some specific way, determined by their location and the locations of the agents they’re communicating with. Even this is just the tip of the iceberg—that is, still a rather low level of detail. We can also introduce stochasticity (that is, randomness). And to go even further, we could switch to a more sophisticated operad, based on a fancier ‘network model’. This entry was posted on Monday, September 4th, 2017 at 10:22 am and is filed under computer science, mathematics, networks. You can follow any responses to this entry through the RSS 2.0 feed. You can leave a response, or trackback from your own site. It is an interesting theory, that reminds me the cluster expansion (in this case of the operads). If it happen a phase transition, where the numbers of edges (less of 100 kilometers) is large enough to allow long-range communication and rescue (I am thinking that little perturbation of the ships configuration give the same statistical phase), then the rescue would be probable: if a statistical description could be possible, then the number of the rescue boat could be adapted to the number of ships, and some lives could be saved. The application of the operation to the arguments is then simply , which gives you the right result. • Applied category theory, Fall Western Sectional Meeting of the AMS, 4-5 November 2017, U.C. Riverside. My former student Brendan Fong is now working with David Spivak at MIT, and they’re both coming. My collaborator John Foley at Metron is also coming: we’re working on the CASCADE project for designing networked systems.